Easy to grasp design allows baby to scoop, fill, and spill and helps to encourage tactile development. 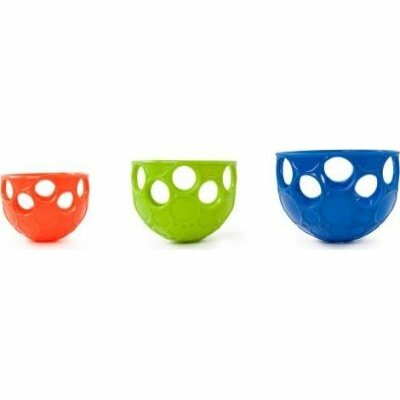 3 different-sized cups in bright colours introduce stacking fun for tactile playtimes. Unique design allows for easy water drainage. No batteries required. Warranty: Kids II is dedicated to creating quality products for babies and young children around the world. We warrant that all Kids II products will be free from defects in material and workmanship (the “Limited Warranty”) for a period of one year from the date of original purchase (sales receipt is required for proof of purchase) (the “Limited Warranty Period”). This Limited Warranty applies to single family use only for the original purchaser/gift recipient (with gift receipt) of the product and is not transferable. This Limited Warranty does not apply to re-sold merchandise. Claims resulting from misuse, failure to follow the instructions (assembly, installation, maintenance, and use), abuse, alteration, involvement in an accident and normal wear and tear are expressly excluded from coverage under this Limited Warranty. If any covered defect is discovered during the Limited Warranty Period, we will, at our sole option, repair or replace the product at no cost to you. This is the sole remedy available to you. THIS LIMITED WARRANTY IS EXCLUSIVE, AND IN LIEU OF ALL OTHER WARRANTIES INCLUDING, WITHOUT LIMITATION, THE WARRANTIES OF MERCHANTABILITY AND FITNESS FOR A PARTICULAR PURPOSE. ANY IMPLIED WARRANTIES THAT CANNOT BE DISCLAIMED ARE LIMITED IN DURATION TO THE LIMITED WARRANTY PERIOD. IN NO EVENT SHALL KIDS II BE LIABLE FOR ANY INDIRECT, INCIDENTAL, CONSEQUENTIAL, SPECIAL OR PUNITIVE DAMAGES, NO MATTER HOW ARISING. Some states do not allow the exclusion of incidental or consequential damages or a limitation on the duration of implied warranties, so the foregoing limitations may not apply to you. In addition, you may have other legal rights, which vary by state. To obtain warranty service, contact the Kids II Consumer Services Department at 1-800-230-8190, submit a support request, or write to Kids II Consumer Services at 3333 Piedmont Rd. NE, Suite 1800, Atlanta, GA 30305. Easy to grasp design allows baby to scoop, fill, and spill and helps to encourage tactile development. 3 different-sized cups in bright colours introduce stacking fun for tactile playtimes. Unique design allows for easy water drainage.